Courtesy of WOWSA, Costa Brava, Catalonia, Spain. Miquel Suñer, author of 48 Braçades, is also the ideologist and promoter of Vies Braves, an open water public network of marine itineraries. "You can swim, explore and enjoy sea swimming lanes along the Spanish coast," Suñer explains. 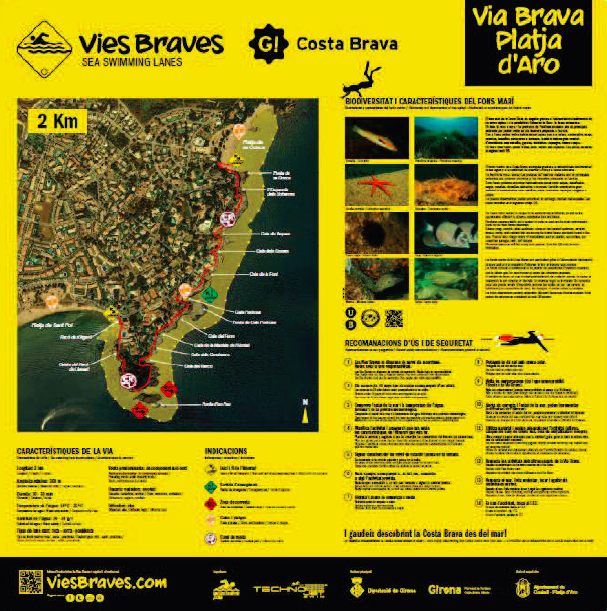 "Vies Braves is a pioneer company in designing, signaling and promoting open water swimming and marine itineraries used for sports, leisure and educational activities. For tourist destinations, Vies Braves is a new quality product, structured within a specific territory that is both sustainable and responsible." Suñer knows that man's relationship with the sea is not good. "Humans threaten this source of life by polluting it, overfishing it, and destroying its coastal ecosystems. The sea is marvelous, full of life. It is crucial for our own survival and well-being. 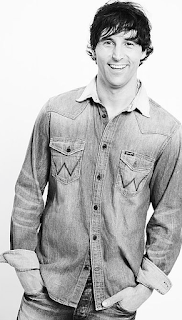 It needs to be preserve and protected." 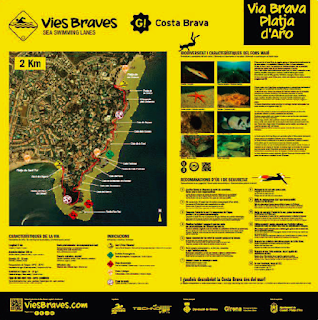 Ultimately and specifically, the mission of Vies Braves project in Costa Brava is to improve the relationship between humanity and the sea. As Suñer describes the fundamental goal of the project along Costa Brava that stretches from Blanes, 60 km northeast of Barcelona, to the French border, "An intimate contact with the sea and nature is a very powerful way to raise environmental awareness." At the heart of the project are the activities by local people and visitors." There are 24 open water swimming courses along 16 different towns, totaling a distance of 27.2 km. Over 3,000 people have participated in swimming and snorkeling meet-ups, non-stop marathon swims, and SwimRuns to date in the new venture. They communicate via Whatsapp, reaching an audience of over 28 million people so far. "We have identified the social impact of Vies Braves in four major areas: sports and health, environmental, public awareness and education. We are working on our outcomes and have partnered with several organizations and companies. At the end of the day, we want to bring people closer to the sea." For more information, visit www.viesbraves.com. Suñer's book 48 Braçades was nominated for the 2017 World Open Water Swimming Offering of the Year. 48 Braçades: Solo tú marcas tu horizonte (48 Swimming Strokes: Only You Set Your Horizons) is a book written in Spanish and Catalan by Suñer with James Manresa. 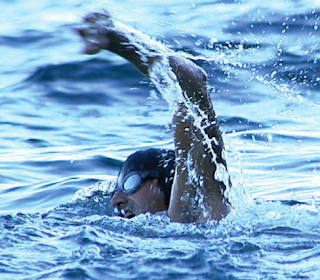 After becoming the 53rd person in history to complete the Triple Crown of Open Water Swimming, Suñer wrote an extraordinary retelling of his aquatic journey from a backstroker and water polo player to an elite marathon swimmer. Writing of the 230-page book fueled the next stage of his purpose-filled life. The 40-year-old engineer, co-creator of Vies Braves, and ambassador of the Menorca Channel Swimming Association describes his perspectives of swimming in the sea under challenging conditions and his frank intimate connection with Mother Nature. But personal solo marathon swimming challenges are not the current focus of his life. "I have not stopped swimming. I train every day, but without a specific goal, my swimming is more than keeping in shape or racing in open water swimming competitions. When I finished the Triple Crown of Open Water Swimming, I did other big swims, but slowly and naturally, I began to spend more time in conveying the lessons learned during my challenges by speaking at conferences and writing an autobiographical book. I suppose that I wanted to share with society all my experiences. At the same time, I want to thank the opportunity to live such unique and unrepeatable experiences. 48 Brazadas has been a unique opportunity to share, slowly, who I am, where I come from, and because I have done what I have done. In the book, I speak about my team, my family, and the sea. It is a story that can also help people improve their lives." But his book is just one of the things I have done in his next phase of his productive life. 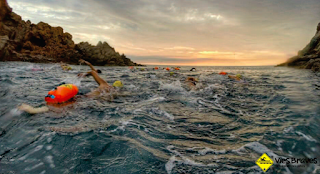 "I am not focused on my personal challenges, but on the Vies Braves project, a unique and pioneering project present in 16 coastal cities in Catalonia, with 27.3 km of safe course for open water swimming practice." He is currently working with the governmental authorities and local administrations to create even more secure spaces. 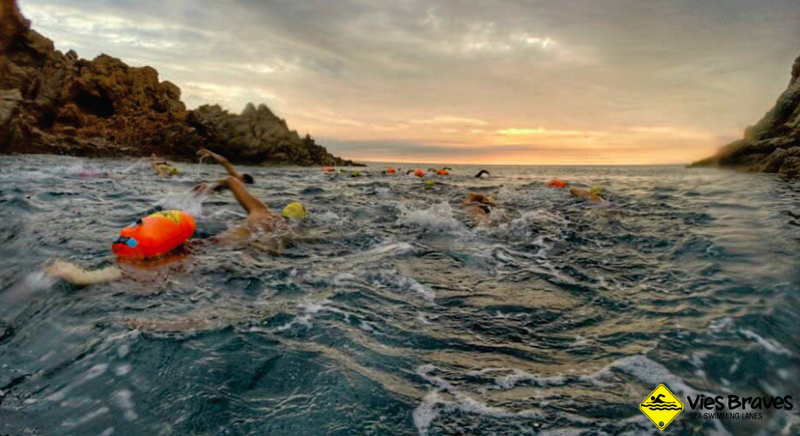 "It is a unique with a mission to improve man's relationship with the sea through open water swimming. We have created safe open water swimming lanes. I think the intimate contact with nature and sea is a very powerful way to stimulate and expand awareness of the sea." Register and vote on the WOWSA Awards, visit here.